For various reasons I had a break from riding while I was pregnant. When the baby came he arrived via an emergency caesarean. As a result of these two things I pretty much didn’t ride for a year. In the hospital the consultant and physio advised I leave it at least three months after the op before I even attempted to bring the horses back into work – this has been one of the few occasions I’ve actually listened to them and heeded their advice. The first tip they had for me was to use a yoga ball. 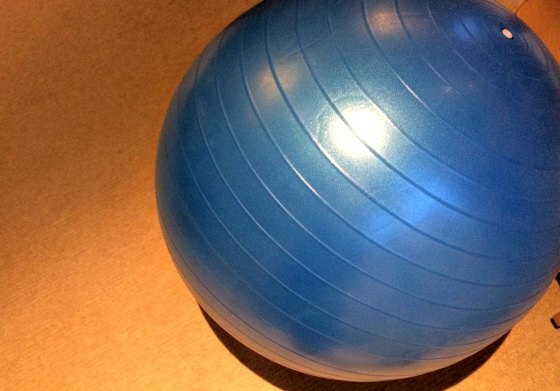 Basically for weeks I used to sit on it, bouncing up and down while watching the tv – I started off doing 10 minutes at a time and then gradually increasing it. After six weeks I started mucking out the stables again – summer was over and the horses needed to come back in. As you can imagine this meant me using various muscles again and helped work on my general fitness. At 3 months I decided it was time to bring my established horse back into work. While the recently backed youngster is a much easier pony to deal with, I know the older one inside and out it should have been a matter of bringing back into work rather than doing a bit of re backing. Amazingly I got him in, tacked him up and lunged him and he was as good as gold – it was almost like he enjoyed being back in work! A week or so later my instructor came, lunged him with some tack on and then helped me get on. Initially I was advised just to walk and trot him around the yard rather than do full school work. This was for two reasons. One, to bring him back into work gently, two to build up my muscles and gage the effect on my tummy in a controlled way. Again he was as good as gold and apart from feeling like a fat donkey rather than a well trained native show horse, was willing, able and fun to be with. Sitting back on a horse for the first time in so long was incredible – it was like I was on the top of the world! After that time it was back in the school and then building up our work as I would after an injury. Luckily for me it was “simples”…. Now to do the same with the youngster!